It seems like Tom Slick wants to fight in Strikeforce against the black man he fought on the bus. UFC 110's main card will begin at 7pm Pacific Time. There is no need to refresh the page. D Wizzle's World will give the results of the prelim fights before 7pm as well. KNOXX and D Wizzle's World are having a contest and the winner will receive a KNOXX signature logo t-shirt. The shirt is valued at $24.99. All you have to do is pick the winners of UFC 110. The winner of the contest is the person that has the most correct picks. To enter this contest, go here and in the comments section below the article, enter your first and last name and your picks for the 10 fights at UFC 110. In case of a tie, the tiebreaker will be the person that has the correct prediction on how and what round the main event between Cain Velasquez and Minotauro Noguiera will end. For example, you can say something like "Velasquez by arm-bar in the second round" or "Noguiera by split decision" or "Velasquez by TKO in the second round." If there is still a tie, the winner will be chosen randomly and all decisions will be final. Your picks must be submitted by 3pm Pacific Time on February 20th. The winner will be announced by Sunday morning here at D Wizzle's World. The winner also must contact D Wizzle's World by February 22nd to claim their prize. The email for D Wizzle's World is on the top of the page. UPDATE: Ben Rothwell is off the card due to an illness and Anthony Perosh is taking his spot. If you selected Rothwell in this contest, Perosh will be your pick unless you change it by 4pm Pacific Time on February 20th. Everyone is eligible to enter the contest but the winner must have a mailing address in the United States. UPDATE: Some entries were posted on this website and some were on the Examiner site so D Wizzle's World will allow entries from this site as well since there was a lot of confusion. Keep checking out D Wizzle's World for more contests and prizes. The winner of this contest will be announced later this evening after the fights are over and the scores are tabulated. There are about 25 entries in total to score. UPDATE: 2/20/09 10PM - The winner of the contest is John Jones who picked six of the nine fights correctly including the main event fight between Cain Velasquez and Minotauro Noguiera. Congratulations to John Jones and thanks to everyone who participated in the contest. Check D Wizzle's World for more contests and giveaways in the future to win more cool prizes. All you have to do is pick the winners of UFC 109:Relentless. The winner of the contest is the person that has the most correct picks. To enter this contest, go here and in the comments section below the article, enter your name and your picks for the 11 fights at UFC 109. You must also give your prediction on how and what round the main event between Randy Couture and Mark Coleman will end. For example, you can say something like "Couture by arm-bar in the second round" or "Coleman by split decision" or "Couture by TKO in the second round." If we have a tie, the tiebreaker will be whoever gets the main event prediction correct. If there is still a tie, the winner will be chosen randomly and all decisions will be final. This contest closes at 5pm Pacific Time. The winner will be announced by Sunday morning here at D Wizzle's World. UPDATE: Congratulations to Sheldon Mui for winning the contest. Please email me with your mailing address and we will send you your KNOXX shirt! This could almost be called a battle of senior citizens. How about the AARP Fight of the Night? Both veterans are in their forties but they still have non-stop motors and continue to be in tremendous physical shape. Couture defeated Brandon Vera in a very unimpressive win by decision in his last fight. Coleman also won his last fight at UFC 100 against Stephan Bonnar by decision. UFC commentator Joe Rogan mentioned that the winner could be in a line for a possible title shot in the near future, but I don't see either fighter as a legitimate contender right now for the UFC light heavyweight title. This fight would have been a great main event about ten years ago but both fighters are now past their prime. I am taking Couture to win by split decision. These two veterans have a combined 78 fights in their MMA careers. The winner will be in line for a shot to fight for the UFC middleweight title currently held by Anderson Silva. Sonnen has been making fans laugh with his interviews of late by making fun of Silva and Coleman. Sonnen is a confident and tough fighter, but he won't win the fight on Saturday night against Marquardt. Marquardt is more skilled in every area than Sonnen, and Marquardt will finish Sonnen in the second round by TKO. Swick is coming off a knee injury and is facing Thiago on short notice. Thiago was supposed to have a rematch with Swick's teammate, Josh Koscheck, but Koscheck got injured during training camp. Swick wants to win so fans will forget about his loss to Dan Hardy at UFC 105. Thiago will want to take this fight to the ground while Swick wants to keep the fight standing. Just like Sonnen, Thiago is a very tough guy and will be hard to finish but Swick is just more talented than him. My pick is Swick by TKO in the second round. Maia suffered his only loss in his professional MMA career when he got knocked out by Marquardt at UFC 102. Miller lost to Sonnen in his last fight at UFC 98. The winner gets back into contention in the UFC middleweight division. My pick is Maia by rear naked choke in the first round. Both fighters are coming off a loss and there is a strong possibility that the loser of this fight may hang up his gloves. This match is very tough to call but I will give the edge to Serra since Trigg looked very bad in his last fight against Koscheck, and Serra has knockout power. Serra will win by knockout in the first round. Buchholtz by split decision after three exciting rounds. Guillard is now training out of Greg Jackson's gym. I expect a knockout from Guillard on Saturday night. Nover passed out before his last fight against Sam Stout but he says that will never happen again because he hired a nutritionist. Emerson expects to knock out Nover. This should be another exciting fight, and I like Emerson to win by TKO in the second round. Davis' nickname is Mr. Wonderful. I believe Stann is now training at Greg Jackson's camp with Guillard. Davis is 4-0 and has been hyped as an up-and-coming fighter by various MMA websites. Vera has been hyping him up as well. I have never seen Davis fight but I will believe the hype and pick Davis to win by TKO in the first round. The last time I saw Hague in the cage was when he got knocked out by Todd Duffee. Tuchscherer is Brock Lesnar's training partner. This is a battle of big heavyweights and I will go with Lesnar's teammate to win by split decision. Beltran's nickname is "The Mexecutioner." Gracie is 3-0 in his career, and I expect him to win his fourth fight on Saturday night by armbar in the first round. 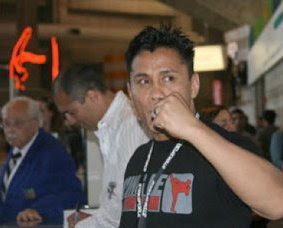 Strikeforce fighter Cung Le will be holding a two hour seminar tonight in Davie, Florida at the American Top Team gym. You can learn advanced kicking, takedowns, and grappling transitions from Le tonight. The cost of the seminar is $50 if you register and $60 at the door. For more information, check out the American Top Team Davie website.